SolutionMap Technology Analysis From Spend Matters – How Might It Help You? We told you last week about the new release of SolutionMap from our colleagues at Spend Matters US. Here (below) is another article from the US team giving more detail about how you can take advantage of this excellent technology analysis. The services discussed in the article - such as support on procurement tech selection decisions - are available outside the US, although most of the work would be carried out by our US colleagues. However, typically much of the support can be provided remotely anyway via the wonders of Webex, Skype and so on! So if you are interested, contact us as per the article or if you find it easier, drop me an email (psmith (at) spendmatters.com) and I can link you up directly with the appropriate colleague. 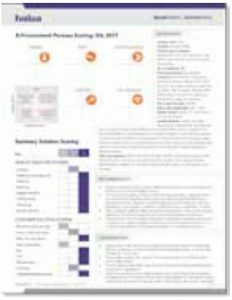 If you’ve been living in a cave — or have been, say, mired in a labyrinthine procurement software RFI process with no hope of finding your way out — you may have missed Spend Matters’ Q1 2018 SolutionMap release earlier this week. The Spend Matters analysts and extended team unveiled comparative rankings of 40 procurement software solution providers, based on buying personas across nine total solution categories and presented in the form of two-by-two graphics. But that’s only the tip of the iceberg. Jason Busch, Spend Matters’ founder and member of the analyst team, had some fessing up to do. On a self-service basis, anyone can sign up for our new SolutionMap Insider subscription. This includes members-only access to Provider Scoring Summary reports and to the ratings of all participating providers. The real magic lives beyond the subscriber view. In Q4 2017, Spend Matters began advising practitioner organizations with SolutionMap data in selection processes. We have now formalized these offerings to cover the “80/20” of scenarios we’ve seen so far in which a deeper or custom view of data can be important. The programs thus far have consisted of two components, which Spend Matters can separate out as needed. Based on the templated approach supported by the underlying SolutionMap data, completing these programs takes only four to six weeks. The first program component is a technology gap analysis, which determines an organization’s desired future state and informs technology selection processes. The second component focuses on requirements identification and shortlist selection. It enables users to tailor RFIs and identify best-fit provider shortlists, as well as access granular insight into provider SolutionMap performance not published externally. As a follow-up to these quick-hit programs, the Spend Matters team can offer end-to-end technology guidance, including advisory check-in calls to review the technology selection process at key milestones (e.g., provider scoring review, negotiations, integration, implementation and optimization planning). The idea is to be as “low touch” (and low cost) as possible, while providing as much support as required. In addition to the above, we also offer specific SolutionMap benchmarking and strategy programs for technology providers (subject to the terms of our competitive intelligence policy). Finally, we offer M&A due diligence benchmarking and analysis services for corporate development and private equity teams engaged in analysis of target companies. Due diligence engagements are carried out with the utmost discretion, with the consent of all participants. Please contact your Spend Matters client services team member for more details, or drop a line directly.